Press Dave’s front pocket to hear him talk with funny expressions. Press again, move his head back and forth, left or right for another response or expression. Press Dave’s tongue and he will think you are feeding him a banana and respond! move hishead or press his pocket to hear Dave make a farting sound! Over 60 Minion phrases and sound effects. Figure is 20cm in height. Batteries included. This toy costs approximately £29.99 (for the latest and best prices make sure you check our retailer list for the Despicable Me 2 20cm Talking Minion Dave above). 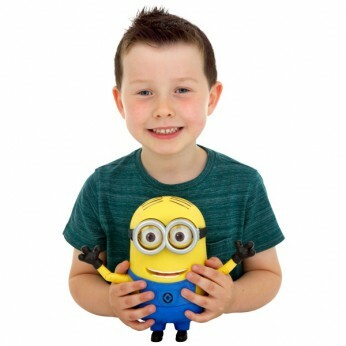 In our review of Despicable Me 2 20cm Talking Minion Dave we classed it as being suitable for ages 3 years, 4 years, 5 years but recommend you check the manufacturer specific advice before purchasing.